1997 Thor Motor Coach Residency Series RV. Please read this whole ad so you understand what I'm looking for and exactly what I have. First off the original owner never had the title notarized which usually wouldn't be a problem but in North Carolina it is so in order for you to get a title in your name 150 Bond will have to be put up and in 6 months you will get the title. Also when you put the bond up you are allowed to register and insure it you just don't get the title for 6 months. I can bring you down to the person I spoke to not a problem if it is then this is not for you. So if you're willing to deal with that then you can continue. 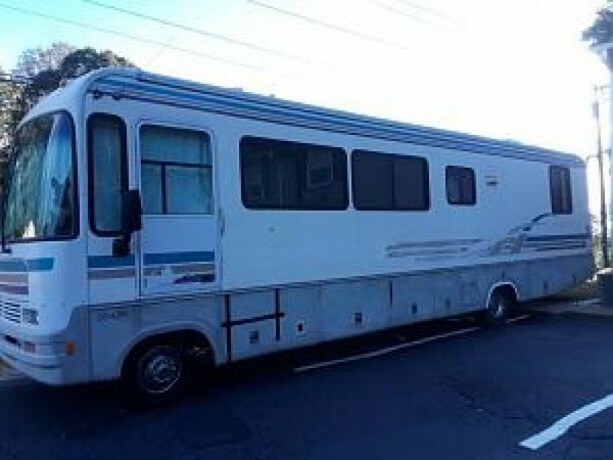 This was sold to me and I had no clue about anything because this was my first RV. I have a salvage title and from what I was told the whole electrical system went out. It has since been replaced everything works I checked. I paid 4,400 for it. If I sell this instead of trading it I'm going to sell it for 4,400 cuz I put more into it already. There is some cosmetic damage and you can see that in the video. Since I made that video there is a tiny piece of the window broken on the passenger side window because when I went to back up I hit the dumpster because this is just too big for me. Even though there is some cosmetic problems the comfort of this RV and the way it drives is well worth it and I'm "FIRM" on what I want including price. I just drove this 10 5 17 from Micco Florida 32976 to Winston Salem North Carolina 27106 and it drove like a baby except for when it gets to a quarter tank of gas it runs out and somebody said something about the gas going to the generator which the starter is supposedly broken so I'm not sure if it getting the gas ??? The only reason why I want to trade this for something smaller / camper with a automatic vehicle or to sell this so I can buy something smaller is because I'm dealing with medical conditions and the doctors gave me 12 months to live almost three and a half months ago so if they are right my time is running out. If I get a smaller one if that's what the god of my understanding wants me to have then I plan on putting "God's Alive" on the front and on each side I want to put leave a verse take a verse. I will have markers either hanging or somewhere on the sides so people can just walk up and put versus there. I then want to travel and touch all the people's lives that have touched me with telling others about the obstacles that I have overcome in life hoping that it can help others through my spirituality. And if God of my understanding wishes for me to trade this for a piece of property then I want to try to help others that have nowhere to go. I haven't figured it out but I'm sure I will when the time comes. There's too many beautiful things out there for me to experience before I do die. All the electrical systems in here work including the two fans that are built in the front. The two AC's work so beautiful and when I was recently living in Florida I would run them 30 days 20 hours a day sometimes and my electric bill was only 139 the most. The shower works great, all sinks drain perfectly. Microwave works great never used the stove it's still brand new. I didn't realize that switch in the bathroom had to be pushed when it popped which ran the refrigerator so I thought it was broken so I went out and bought a brand new one for 300 so I use the old one for dry food storage. I can't do a rent to own. I can't do monthly payments. I can't trade it for anything I cannot live in. Now if you have a piece of property with the mobile home or ??? maybe we can talk but I don't want to be in a mobile home park.